Bestowed with characters at their respective nadirs, “Expectations” from Texas singer/songwriter AJ LeGrand is a lesson in hard truth. All relations of the sage narrator, “Expectations” is a wispy shake of the family tree. 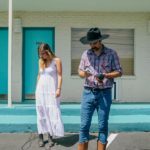 A musical kin to the pre-Oscars Ryan Bingham, LeGrand is set to release his debut LP after a successful crowdsourcing campaign. The title track from LeGrand’s forthcoming debut LP, you can watch the video for “Expectations” below.